NEW YORK (CNS) — Sir Arthur Conan Doyle’s legendary detective and his doctor sidekick are given a comedic makeover in “Holmes & Watson” (Columbia). A successful result, however, is far from elementary. 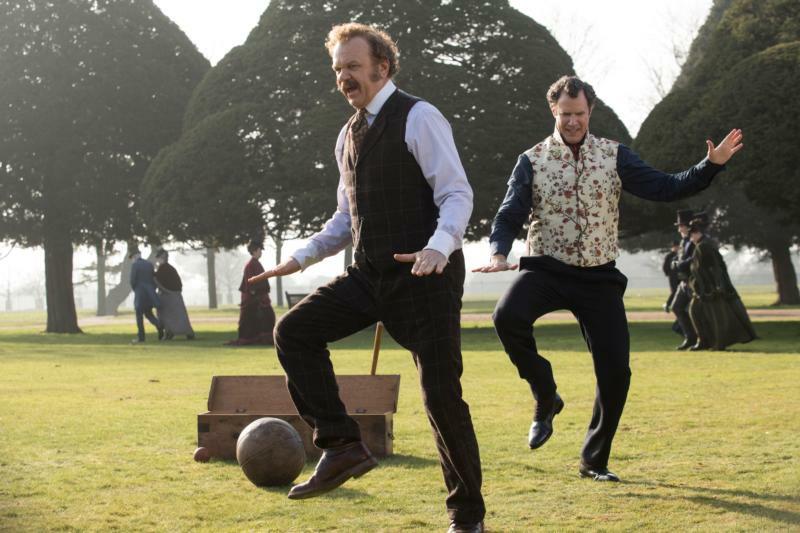 Will Farrell and John C. Reilly are, at first glance, an inspired choice to play Sherlock Holmes and Dr. John Watson, respectively, in a send-up of the manners and propriety of Victorian-era Britain. But “Holmes & Watson” veers to the mindless, raucous, and exceedingly vulgar humor on display in the duo’s previous outings, “Talladega Nights: The Ballad of Ricky Bobby” and “Step Brothers,” placing this film out-of-bounds for most viewers. Fans of the Conan Doyle stories will recognize only the names of the principal characters. Holmes is vain and insecure, taking cocaine like candy and wearing a red fez with the words, “Make England Great Again.” He and Watson have a bromance that veers uncomfortably at times into a genuine love affair. Holmes’ housekeeper, Mrs. Hudson (Kelly Macdonald), is a sassy flirt who entertains gentleman callers in the next room. Hailed as the greatest detective in Britain, Holmes is feted on his birthday by Queen Victoria (Pam Ferris) at Buckingham Palace. A dead body tumbles out of the enormous cake, bearing an ominous note from Holmes’ arch enemy, Professor James Moriarty (Ralph Fiennes), threatening the monarch’s life. Holmes, meanwhile, is enchanted by Hart’s assistant, Millie (Lauren Lapkus), a mute who was raised by feral cats and has a mental age of 4. Yes, “Holmes & Watson,” as written by Etan Cohen (who also directed), is that silly. It’s also ignorant of history. The climax occurs on board the RMS Titanic, where Queen Victoria hosts a reception. Never mind that the ocean liner’s maiden voyage was in 1912, 11 years after the monarch’s death. The film contains recurring crude sexual language and bathroom humor, including references to masturbation, drug references, comic violence and occasional rough and crude language. The Catholic News Service classification is L — limited adult audience, films whose problematic content many adults would find troubling. The Motion Picture Association of America rating is PG-13 — parents strongly cautioned. Some material may be inappropriate for children under 13.